The Mitchell-Tappan House was built in 1897 by the Oliver Iron Mining Company for their Superintendent, Pentecost Mitchell. William Marshall Tappan was the second Superintendent to live in the home. The town of Hibbing, known as "The Town that Moved", grew rapidly in its early years due to iron mining. Around 1915, iron was discovered underneath the town. Negotiations between the Oliver Mining Co. and the village finally brought about a plan whereby the entire city would relocate to a site two miles south. The Mitchell-Tappan House was one of the first homes to be relocated in 1919 as a way for the Oliver Mining Co. to show the residents that it could be done. About 200 structures were moved. The last house was moved in 1968. 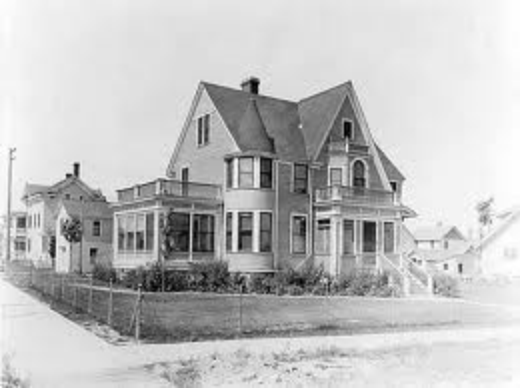 The circa 1920 photo above, from the collection of the Minnesota Historical Society, is of the house in its new location.